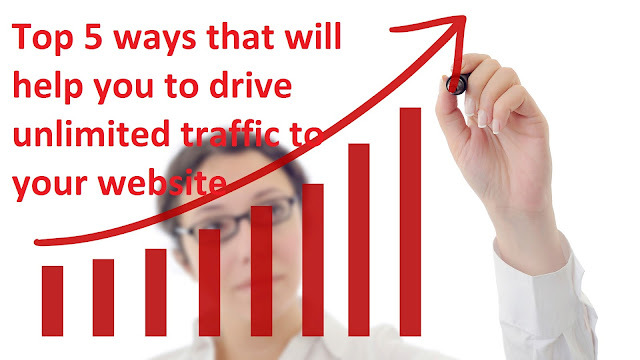 Getting Traffic on your website is not a easy task.there are various ways to get traffic on your website but organic traffic is best traffic for you website.here we will talk about Top 5 ways that will help you to drive unlimited traffic to your website.that will help you to get huge organic traffic on your website. Tittle of your post was are very important part of your post.getting higher ranking of post its not only depend upon on your content,theme,image,comment etc.Tittle of post was also play a very important role in your post.the keyword on your post tittle are help you to get ranking on first page of google.you need to use Long tail keyword in your tittle.analyse your competitor tittle.do proper keyword research.and make sure you use interesting tittle on post like i will find keyword "TOP 10 android apps" now i will make it in long-tail keyword or in interesting tittle like '"top 10 android apps that Blow your mind'. If you haven't been considering this then it's high time you did. Creating quality content is simply irreplaceable. With this you create a long lasting relationship with your readers and a possible large following. Every day, we have readers looking for information and if they got what they were looking for from your site last time, it is very likely they will hit the bookmark add button without second thoughts. Great content is also a good strategy to staying in good terms with the search engines. Keeping in mind that these are one of the best sources of traffic around, you wouldn't want to be stepping on their toes. Search engines aim at providing high quality content to their customers and wouldn't direct traffic to sites that do not deserve. So you would be asking, what solid content is? This is content that keeps the readers engaged and informed at the same time. In simple terms, at the end of the article the reader should be able to get the help that they wanted or solution to the problem that they had in mind. Furthermore, they should be able to read through the whole article until the end without being bored. In essence, great content is vital for creating a royalty relationship between the reader and the website owner. Great content can also be used as a catch for your website visitors to opt-in with their emails and help you build your list. This is one part that many miss and think is natural, but can also be a great to pull in some massive traffic. A simple guess I would throw in right now is that your website has some images on it, but are you taking advantage of this? Bare in mind that search engines also have a functionality to search for images from websites. How do they do this? They search the tags attached to image or the image name. When building websites with platforms like word press, you have an option of tagging the image with names related to the image and article it has been placed in. So, when someone is searching for articles related to the image tags placed they get your image as part of the image search results. Well, that is not all. After tagging your image with the appropriate keywords, you would want to also let other sites know that you have this image on your websites. Just like when you share a new blog post via Facebook, Twitter or Stumble Upon, you should share it via Pinterest, social media site where pictures are shared. If your picture is interesting enough, it will surely get pinned by many and get many shares. However, for this to be more effective you must link the image on Pinterest to your website. Lastly, you want to keep your readers on your site as much as possible. So, as an extra salt to pepper, you must link your images to other pages related to the article or image with the idea that, for instance, if the reader is reading about quick ways to lose weight and the image is showing a man with a large belly, then you could link this to an article about losing belly fat. I couldn't go on telling you methods of drawing unlimited traffic without mentioning Facebook now could I? Well, Facebook as one of the largest social media sites keeps on growing with time and that's where a lot of people spend are spending their time. What you have to do here is head over to Facebook and create your website's Facebook page. This page must somehow resemble what your websites is like. Similarities to consider include; the "about" information that you enter and the page theme. The next step that you will have to go through is getting likes for your page. You can always start by sharing the link to your page to friends and family just to give the page a little boost. Otherwise, you must then advertise your page on the Facebook adverts to get more targeted likes using the Facebook advertisement manager. This function lets you have a targeted audience of the adverts, based on age, country and gender. So, if your page and websites are middle-aged ladies, then your campaign will be focused on the respective age and gender. In addition, remember to change the adverts frequently so that they do not become familiar and stop being effective. With such type of advert campaigns, it is only wise to have a fixed budget set per day that you can afford so that you don't go beyond what you can afford. Furthermore, you will need to engage your Facebook followers by adding some short but helpful tips or quotes that they can read and follow quickly. Remember, this a social media network and not a blog because most readers will be likely to have a short attention span. So, when you have a new post or a new feature or product you would like to share to your esteemed followers, you share it to your Facebook page and the readers are most likely to click through because of the reader-writer engagement that you created. Whenever you read something interesting on a website, you want to let other people know that you read it and want to share it with friends. Well, what other better way to share such information than social media. With that same thought in mind, you add social media buttons on your posts. If you are using Wordpress, then this can be done easily by adding related plug-ins or the Wordpress Jetpack plug-in which is all inclusive and has a the social media buttons module which includes Facebook, Twitter, Google Plus and Pintrest among others.